It was my birthday on Wednesday, and I really wasn’t going to make a thing of it, but I got so much unexpected love and such thoughtful and sweet gifts that I wanted to show ’em off a bit. Judith got me a whole bunch of Japanese books she happened across at a thrift store. Some of them are children’s books which are great for reading practice when your kanji comprehension is atrocious (yes, that would be me), and the rest seem like text books for lower grades in Japan rather than actual “Hey foreigner! Learn some Japanese!” books (well, except for one). Marelle and Kendyl got me some funny stickers and a gift voucher for Minotaur (for non-Melburnians, Minotaur is a shop that is more or less the geek mother ship). And Jules (of Woollenflower fame) got me two amazing old crochet books, which I’m sure you’ll see more of. “Crochet Sweaters” is a priceless mix of really tasteful and timeless gems (including a couple for gentlemen!) and utterly tragic disasters that makes me laugh so hard that I’m in danger of peeing myself. Not kidding. "How do you do, Raynor? I'm your new home. Step inside, won't you?" Finally… tomorrow (Friday) is the last day to comment on my other post here to win yourself a squishable, scrummy ball of yarn. So, go do that! I want to share the love. Your Thoughts? A Penny For Them. Happy Birthday:-) I also love vintage crochet books, – alone the ads in books from the start of the 19th century are pretty hilarious. The Australia crochet book you got looks interesting as well. Ah Happy Birthday Raynor! I think you received a fabulous bounty of goodies and it’s obviously made your day a special one. 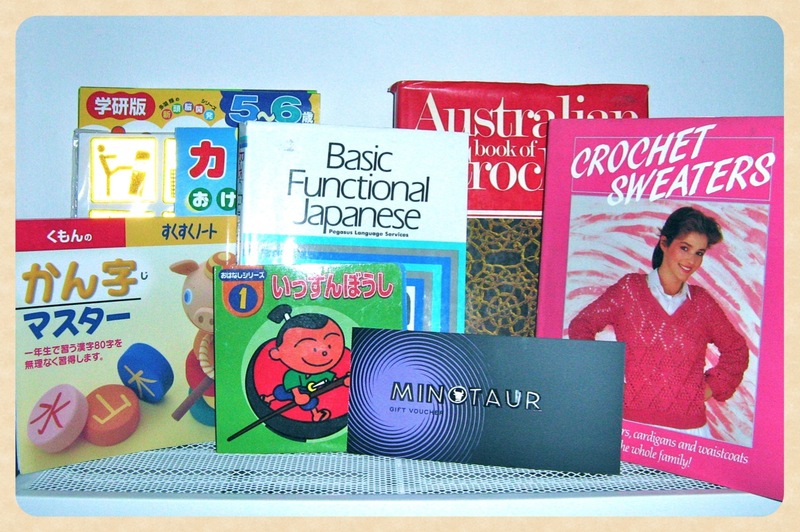 I love the op shop/thrifty gift myself and would have been just as excited about the Japanese books (had I been trying to learn the language!). Which brings me to my best present – well it’s kind of similar – I was let loose in a fantastic 2nd hand/collectibles/op shop…”just pick up whatever you want and take all the time you like”….I had a ball and found some lovely things for myself…ahhhh bliss. Thank you! I was super stoked about it; I’m pondering going to back to school for Japanese; I don’t know yet. It’s a big decision! I have so much to saaaaay to this! *hyperventilates*. I just “met” Katie this morning. I have already asked her to marry me. I was just sent two old knitting books and a crochet book. One was even christmas-themed! I also picked up an old crochet book at the markets that is insanely cool. I am going to Japan in two weeks, for my second trip, so you’re going to have to email me your postal address so I can send you the things I will totally be buying you from Tokyo. In two weeks!? I’m SO JEL! Are you for serious!? I’ll totes send you my address. Homg homg! You’re cray-cray, lady! Nice birthday stash!! 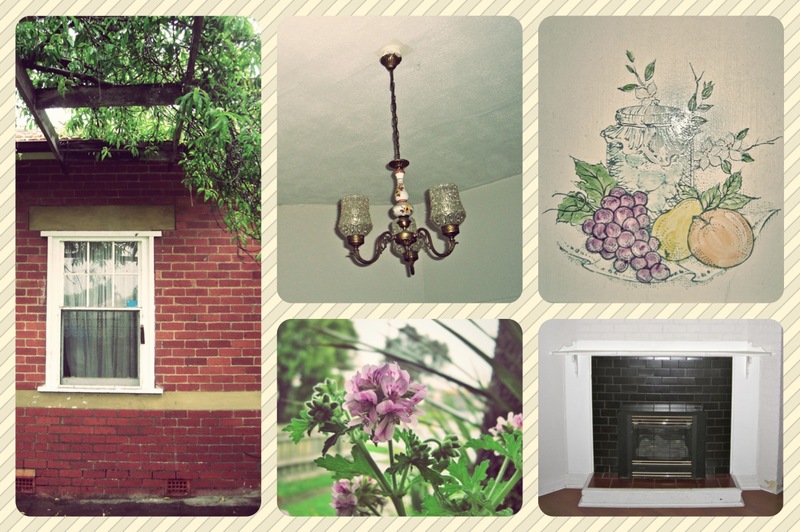 And those pics make your new home look pretty homey already. I really want to go back to uni, but there’s a millon other things I want to do, so I’m not sure how it’ll pan out. I’ll keep you posted! 誕生日おめでとう。 (Happy Birthday!) It looks like you got some cool stuff! I used to be almost fluent in Japanese but it’s been way too long and I’m losing it now… I would love to have someone to practice with! It’s definitely a use-it-or-lose-it thing isn’t it? I can hardly bare to think how much vocab I’ve forgotten! Tony’s quite the Japan speaker too. Practice for the win! we should do an online practice chat or something.